I just finished Cinder and so if this review is a little exuberant, it is because I am fresh off the new-book-high. When I read advance praise for the novel, I was immediately intrigued. 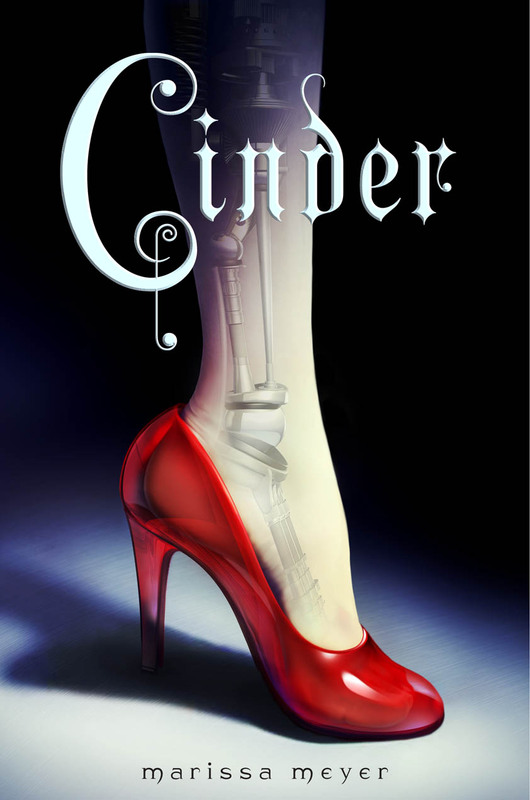 A cyborg Cinderella story? A future infected with the blue plague? Lunar mutants? Sign me up! I enjoyed this fun read by a new author. As soon as my copy arrived to my library, I checked it out, proud to be first in the system-wide holds queue. I have to say, two days later, that I was not disappointed. In fact, I am eager to read Book Two in the Chronicles. Admittedly, I am a sucker for fractured fairy tales and fairy tales retold. However, I found Meyer’s universe to be creatively imagined, with a slightly familiar culture changed by the ravages of war, plague and increasing threats from a powerful and terrifying Lunar Queen. Cinder is a teenage girl, like many others. Except she is 33% cyborg. Nearly killed in a childhood accident, she has been fitted with an artificial hand, foot and internal computer that controls some aspects of her biology. For instance, due to controls that keep her from overheating, she cannot blush. She cannot shed tears. Cinder cannot remember anything of her life before the accident and she cannot escape the cruel treatment of her legal guardian (the wicked step-mother figure) or society as a whole. As a cyborg, she is denied any recognition of humanity. She is a second class citizen, a slave to her guardian’s whims and unable to gain any kind of legal independence. Relegated to working in a tiny shop in New Beijing as a mechanic, her earnings deposited into her stepmother’s account, she dreams of freedom. Her only constant companion is an outdated but endearing android, Iko. Her step-sister, Linh Peony is kind, but too soon tragedy strikes and she is sent to quarantine. A plague outbreak strikes the boisterous marketplace, prompting confinement of those affected and the destruction of infected booths. This takes place after the Crown Prince visits her booth upon hearing of her skills with his personal android that has mysteriously become inoperable. Assuring the Prince that it will be ready before the Ball to commemorate the anniversary of the end of the Fourth World War, she steals away from the panicked market square with Iko and the android in tow. When Peony takes ill, her stepmother blames Cinder and punishes her most cruelly. Determined to seize her freedom, Cinder defies logic when she escapes not only the ravages of the plague but manages to capture the Prince’s affections. Her world is unraveled when secrets held deep within the Prince’s android come to light, and she must defy not only her society, but her entire planet, and the Lunar Queen. This is Meyer’s debut novel. This entry was posted in Books and tagged Android, Cinderella, cinderella reboot, conder, Crown Prince, cyborg, fairy tale, lunar chronicles, marissa meyer, Plague, Prince, prince kai, teen fiction, young adult fiction by S.D. McPhail. Bookmark the permalink.